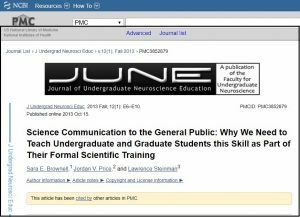 Brownell SE., Price JV., & Steinman L.
Science Communication to the General Public: Why We Need to Teach Undergraduate and Graduate Students this Skill as Part of Their Formal Scientific Training. Do you think that communication of science to the general public is a responsibility of scientists? If the answer is yes, are scientists able to do this? In this article, the authors say that while scientists are thoroughly trained in research methodologies, analytical skills, and the ability to communicate with other scientists, most often, they do not get trained in the communication of scientific concepts to a layperson audience. In addition to this we can add that, in linguistically diverse country like India for an effective communication it is also required that scientist or medical professionals must able to communicate in the regional and local languages for better understanding of their audience. This entry was posted in 3 - Interesting Articles. Bookmark the permalink. Soups and inhalers to create ELearning courses!